American Honda Motor Company of Torrance, Calif., is recalling about 200,000 Honda EU2200i, EU2200i Companion and EB2200i portable generators. The generator can leak gasoline from the fuel valve, posing fire and burn hazards. The firm has received 19 reports of fuel leaking from the fuel valve. No injuries have been reported. American Honda Motor Company of Torrance, Calif., is recalling about 34,000 Honda portable generators. The carburetor can leak gasoline, posing fire and burn hazards. The company has received 38 reports of fuel leakage from the generators. No fires or injuries have been reported. This recall involves Honda portable gasoline generators with model numbers EB2800i and EG2800i with a red front cover and a black metal frame. Pramac America of Kearney, NE, is recalling about 7,700 Powermate Sx 5500 portable generators. The fuel filter on the generator allows gasoline to leak, posing a fire hazard. The company has received 51 reports of fuel filter leakage. No fires or injuries have been reported. The recalled portable generators have "Powermate 5500" printed on the side of the black generator with wheels. These generators were sold under the model name Sx5500 and model number PM0125500. Both are printed on a plate on the rear of the generators with serial numbers of the recalled units ranging from K003xxxxxQ through K090xxxxxQ. The generators, manufactured in China, were sold exclusively at Home Depot stores in northeast, mid-west and southeast United States from February 2012 through August 2012 for about $550. Consumers should stop using these recalled portable generators and contact Pramac America to receive a free repair kit including a replacement filter, hose and hose clamps for fuel line. Consumer s may contact Pramac America LLC at (800) 445-1805 from 7 a.m. to 5 p.m. CT Monday through Friday. 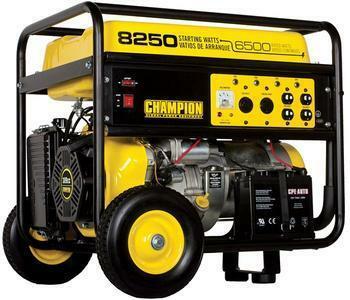 Champion Power Equipment of Santa Fe Springs, CA, is recalling about 8,600 portable generators. Fuel can leak from the generator's carburetor, posing a fire hazard. There have been 11 reports of fuel leaking from the generators, including eight reports of the generators catching fire and two of property damage. This recall involves two models of Champion Power Equipment portable generators. Both models have a black frame with black and yellow control panels, a bar handle and two wheels. Model number 41332 has an open frame. The words "Champion Power Equipment" are on the control panel and "8250 starting watts" and "6500 running watts" are on the side of the fuel tank. Model number 41532 has side panels that cover the long sides of the fuel tank. The words "Champion Power Equipment" are on the side panel above the control panel, and "9000 starting watts" and "7000 running watts" are on the control panel. The model number and serial number are located on the side of the generator with the handle, on a tag on the crossbar above the yellow generator end cap. The generators, made in China were sold exclusively at Costco Wholesale stores nationwide from December 2011 through July 2012 for about $699. Consumers should stop using the recalled generators immediately and contact Champion Power Equipment for a free repair kit to be installed by an authorized dealer. The consumer may also return the unit to Costco for a full refund. Consumers may contact Champion Power Equipment toll-free at (855) 236-9424, from 8:30 a.m. to 5 p.m. PT Monday through Friday or by e-mail at support@cpeauto.com. 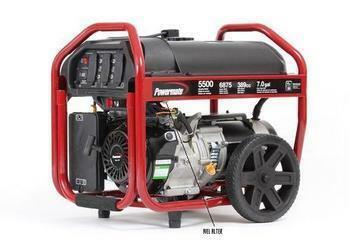 Robin America Inc., of Lake Zurich, Ill., is recalling about 4,500 portable gasoline generators in the U.S and Canada. The fuel tank can leak, posing a fire or burn hazard. The company has received four reports of fuel leakage. No injuries or property damage have been reported. The generators, manufactured in China, were sold at authorized Subaru Power Equipment dealers nationwide, including authorized Internet dealers, between September 2011, and January 2013, for approximately $920 to $1800. Consumers should immediately stop using the generators and contact Robin America to schedule a free repair. Consumers may contact Robin America toll-free at (866) 664-1363 from 8 a.m. and 5 p.m. ET Monday through Friday. American Honda Motor of Torrance, Calif., is recalling about 8,100 gas-powered generators. The rear frame support can fail during lifting, posing an impact hazard. In addition, the owner’s manual can have missing or duplicated pages, which could cause consumers not to receive important operating or safety information. J.D. North America Corp., of Charlotte, N.C., is recalling about 12,300 All Power portable gasoline generators sold in the U.S. and Mexico. The fuel tank can leak, posing explosion, fire and burn hazards. The firm has received 21 reports of fuel leakage. No injuries or property damage have been reported. This recall involves All Power portable gasoline generators with model numbers APGG6000 and APGG7500. The black and red generators have a black fuel tank on top of the units. Model APGG6000 generators are rated at 6,000 watts and have UPC code 8 4676600055 3 and serial number JD29014S18035 through JD29014U020742. Model APGG7500 generators are rated at 7,500 watts and have UPC code 8 4676600056 0 and serial number JD42014S16027 through JD42014T210606. The model number is located on both sides of the unit. The UPC code and serial number can be found on a silver plate on the upper right hand-side of the back side panel. The generators, manufactured in China, were sold at Big Sandy Superstores, Family Farm & Home, Inc., Home Owners Bargain Outlet, Mills Fleet Farm Corp., Nexcom West Coast and other stores nationwide and online at Bluestem.com, BrandsmartUSA.com, HomeDepot.com, hoboonline.com, jbtoolsales.com and other online retailers from March 2014, through May 2016, for between $510 and $725. Consumers should immediately stop using the recalled generators and contact J.D. North America to schedule a free replacement fuel tank, including installation. Consumers may contact J.D. North America toll-free at (844) 287-4655 from 9 a.m. to 5 p.m. ET Monday through Friday, by email at apggrecall@jdna.com, or online at www.allpoweramerica.com and click on the APGG Recall link for more information. MWE Investments of Columbus, Ohio, is recalling about 4,500 Westinghouse portable inverter generators. The generators can overheat, posing a fire hazard to consumers. The company has received four reports of the recalled generators overheating and catching on fire. No injuries have been reported. Husqvarna is realling about 600Poulan Pro generators. The carburetor can fail allowing gasoline to leak, posing a fire hazard to consumers. The firm has received four reports of fuel leakage. No injuries have been reported. This recall involves gas-powered Poulan Pro Generators designed for residential use. Models included in the recall are: PP4300, PP6600, PP6600E and PP7600E, all serial numbers. The generator's model number can be found on the front of the fuel tank on the Serial Number Plate. 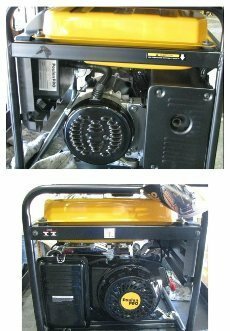 The generators are black and marigold color, measure 21.5" H x 26.6" L x 21.3" range from 4.4 to 7.6 KW with two handles and two wheels. Poulan Pro and Husqvarna authorized dealers sold the generators nationwide from July 2010 through September 2010 for between $600 and $1,000. They were made in China. Consumers should immediately stop using the recalled generators and contact Husqvarna to arrange a free repair. Husqvarna is realling about 600 Poulan Pro generators. The carburetor can fail allowing gasoline to leak, posing a fire hazard to consumers. 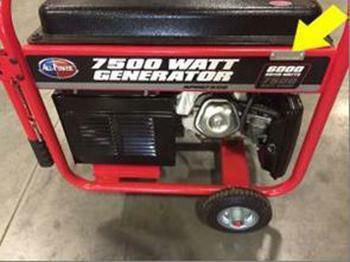 General Power Products is recalling about 13,000 portable generators. The generators fuel valve can be damaged by the cover plate during shipment and cause a fuel leak and fuel spillage during use, posing a fire hazard to consumers. General Power Products has received 14 reports of damaged fuel valves. No injuries have been reported. 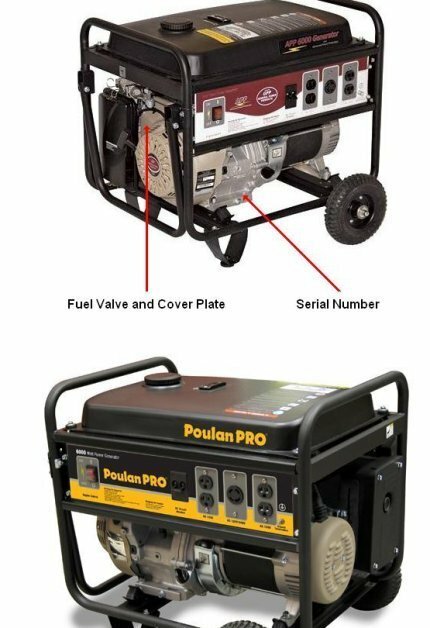 This recall includes the General Power Products 6000 Watt portable generator and the Poulan Pro 6000 Watt portable generator with serial numbers 060400483 through 060600725. The serial number is stamped on the engine block which is located on the front of the engine below the generators control panel. General Power Products and 6000 Generator are printed on the side of the General Power Products generator. Poulan Pro and 6000 watts are printed on the side of the Poulan Pro generator. The generators were sold at hardware and home improvement stores primarily located in Illinois, Indiana, Louisiana, Ohio and Texas from June 2008 through September 2008 for between $600 and $800. They were made in China. Consumers should immediately stop using the generators and contact General Power Products to determine if the generators fuel valve is damaged and, if it is, to receive a free repair kit and instructions. For additional information, contact General Power Products toll-free at (877) 428-3769 24 hours a day, seven days a week, or visit the firms Web site at www.generalpowerproducts.com. October 14, 2008 General Power Products is recalling about 13,000 portable generators. The generators fuel valve can be damaged by the cover plate during shipment and cause a fuel leak and fuel spillage during use, posing a fire hazard to consumers. About 52,000 Homelite, Husky and Black Max brand generators are being recalled. The fuel gauge can leak excessive amounts of gasoline, posing a fire hazard to consumers. This recall involves Homelite and Husky brand generators sold exclusively at Home Depot stores and Black Max brand generators sold exclusively at Sams Club stores. Affected generators include Homelite models HG3500, HG3510, HG5700 and HG5700R, Husky models HU3650, HUCA5700 and HUCA7000 and Black Max models BM10700A, BM10700B, BM10711A, BM10700DG, BM10700R, BM10700BR & BM10722G. Generators included in this recall have manufacturing date codes between BML306-BMM151, CHL122-CHM151 and CRL153-CRM059. 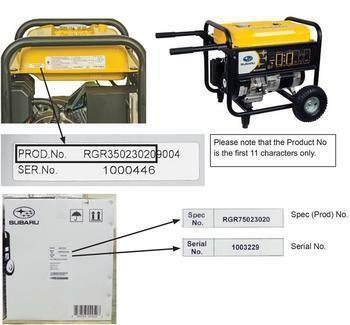 The model number and manufacturing date code are included on the data label located on the top or side of the generator engine. Products with a green dot on the outside of the package or a silver dot on the fuel gauge face are not included in the recall. The generators, made in China, were sold exclusively at Home Depot and Sams Club stores nationwide from July 2008 through May 2009 for between $480 and $1,600. Consumers should immediately stop using their generator and contact Homelite Consumer Products Inc. (Homelite and Husky brands only) or Black Max (Black Max brands only) for a free repair kit. For additional information regarding Homelite or Husky brand generators, contact Homelite Consumer Products, Inc. at (800) 242-4672 between 8 a.m. and 5 p.m. ET Monday through Friday, or visit www.homelite.com. For additional information regarding Black Max brand generators, contact Black Max at (800) 726-5760 between 8 a.m. and 5 p.m. ET Monday through Friday or visiting www.blackmaxtools.com. August 13, 2009 About 52,000 Homelite, Husky and Black Max brand generators are being recalled. The fuel gauge can leak excessive amounts of gasoline, posing a fire hazard to consumers.